I'm not going to lie… there was a time where I didn't want to pick back up my yoga practice after having two kids. 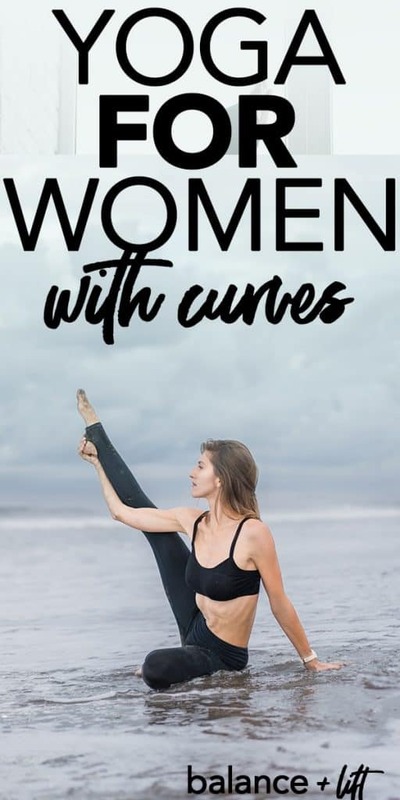 I thought “yoga for women with curves” was a fallacy. None of these women LOOKED like me. This really got to me for a while. Women are objectified and told how they should look, so looking any other way is looked down upon. I started poking around on Instagram and found a few people that weren't your typical yoga body type and found the hashtag #curvyyoga and started to feel better about myself. And, about doing yoga also. Even though I'm not really considered a “plus sized” person by societies standards I'm also not a skinny person either. What Can You Do Yoga Wise? 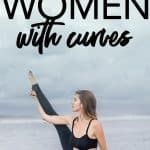 Is Yoga for Women With Curves? It's taken me so long to accept that. I could do some new diet, or workout like a crazy person, or try to fit myself into a box…. but why? Why should I change who I am if I'm ok with how I am? If I eat healthy foods, lead an active life, and am not gorging on processed junk then why should I change who I am to please others ideas of what's healthy? You shouldn't have to change your entire body unless it's YOUR choice. But, if you want to keep yourself active and moving then I want to help. Don't let having curves, a little extra weight, fluff, squish, or whatever other names you want to call it, get in the way of doing things you may enjoy or do enjoy. If you want to practice yoga then here me… Girl, you get on that mat and you do things you can do. There are tons of poses you can do if you're a woman with curves. You might not realize it but there tons of women out there proving people wrong. Check out that link above for the hashtag on Instagram. Here's a woman I've followed for a while. She inspires me daily. Sometimes I maintain so much fight I don’t even realize how much I need to heal. Right now I definitely need it. I feel a little numb. Like I’ve been through a war of sorts and I am coming home to myself like I have many times before. A familiar sentiment: growth. Always a bit precarious until it isn’t. One day you realize you’ve gotten stronger, softer, shifted a pattern, already showed up for yourself and didn’t even acknowledge it. One day you realize you’re “there” and maybe you have been many times before. Well, lady… I'm glad you asked. You can do a whole lotta yoga! Seriously! The sky is the limit here… It all starts with you starting a yoga practice. I'm going to give you a little yoga sequence below that's amazing for women who have curves, fluff, squish, whatever. Now, I'm not going to lie and say this may or may not help you lose weight. But, this sequence DOES feel great and provides some amazing stretches. There are relaxing poses, strengthening poses and poses that help to improve flexibility. To start off in Child's Pose come down onto your knees with your big toes touching. Either keep your knees together or slightly separate them to hip or wider if needed. From here slowly bend forward to place your forehead on the ground and either reach your arms out in front of you or slide them back by your sides. Rest here for 10-20 breaths. Once you've relaxed and feel grounded from breathing in Child's Pose come up onto your hands and knees. Play with these two poses and see what feels best. Stretching in a way that feels really good in your muscles and joints here. You can circle your back from Cat Pose to Cow Pose to really get your back loosened up. Then come back to your breath and on an inhale look towards the ceiling and let your belly drop towards the floor. Really letting it sink and stretch. On your exhale slowly raise your back up into Cat Pose as high and as round as you can make it. Squish all the air from your lungs here. Repeat through this inhale and exhale sequence at least 10 times. Curl your toes under and push up into Plank Pose. From Plank Pose lift your hips towards the sky as you press back into Downward Dog. Feet should be hip distance apart. Shift forward from Downward Facing Dog into Plank Pose and hold for a breath. Lower down into Chaturanga Dandasana and roll forward into Upward Facing Dog. Remain in Upward Facing Dog for 5 breaths. Breathe through the sensations you may feel. Press back up into Plank Pose and shift your weight back into Downward Facing Dog pose. Lift your right leg back and up into the air and then bring it forward between your hands and press up into High Lunge Pose. From here, twist your back foot to a 45-degree angle and raise your hands up over your head. Try to get your front thigh parallel to the ground without your knee extending over your toes. Keep your legs engaged as you press firmly into the ground. Engage your core pulling your belly towards your spine as your lengthen up your back and keep reaching high above your head. Remain here for 5 breaths and then switch sides to hold for another 5 breaths. From Warrior 1 place your hands down to the ground and step your foot back into Plank Pose. Switch legs by bringing your opposite leg forward and dropping it to the ground in a bent leg position (like above). Lower down to the ground and lean forward over your leg. This is a really deep hip opener. If you can't lower down to the ground you can roll up a towel or use a pillow and place it under your hips to give you some help in this pose. But, if you want more stretch you can sit up and try to reach backward (also like in the photo). Remain on each side for at least 5 breaths. When you come out of Pigeon Pose on your other leg, swing your stretched out leg in front of you and straighten both legs out. From here, if you can grab your toes I want you to do that. If not, you can use a yoga strap to put around your feet to help you lean forward. A belt works too if you don't have a strap. In this pose, it's best to keep your back straight. Try not to round your back as you fold forward. This helps to increase your flexibility in your hamstrings so that you can completely fold forward later. Rest here for 10 breaths. Try to gently pull yourself deeper into the stretch until you feel like you've stretched far enough. Come back to a seated position with your legs in front of you and take your right/left leg and bend it to put your foot into your groin area. Fold forward over your leg keeping your back as straight as possible as you fold. If you can't reach your nose to your knee then use a yoga strap or belt to help you fold deeper into the pose. Remain in this pose for 5 breaths and then switch sides for another 5 breaths. Bring both legs back in front of you and sit up straight. Lift your legs either into a V position or a bent leg position (like above). Make sure to keep your spine straight and your core engaged in this pose. This is a great core strength builder and a balancing pose. If necessary, lightly place your hands down to your side. Try to keep from touching the ground too long. Only touch the ground if you feel yourself about to wobble out of the pose. Lay back on your mat with your arms at your sides and your palms facing up. Let your feel relax out to the sides as well. Breathe deeply for 5-10 breaths and then let your breathing return to normal. Try to relax the muscles of the face and then do a body scan down your body to relax and release all the tension. Remain in Savasana for at least 5 minutes. Girl, don't let your beautiful-self miss out on yoga because you don't look like some of those Instagram women. Search out others who are like you and find inspiration to get on your mat. The only limitation is the one you find on your mat. Generally, they're physical limitations, but you can totally work through them. For instance, if you can't reach your toes… well, you just work on your flexibility until you can!